I hes­i­tate to even call this a recipe, as it’s so basic it’s really more of a guide­line. These cold morsels of nom­ness con­tain the tri­fecta of fla­vor– banana, peanut but­ter and choco­late, mak­ing for a lux­u­ri­ous ice cream-esque bite. You can always sub­sti­tute a dif­fer­ent nut butter. Line a cookie sheet with waxed paper or parch­ment. Slice bananas into coins about 1/2–3/4 inch thick. Spread a lit­tle dol­lop of peanut but­ter on top of each one. In a small bowl, com­bine the choco­late chips and milk (remem­ber, less is more). Microwave in 15 sec­ond incre­ments until you can whisk them together. You want it to be a dipable con­sis­tency, not spread­able. Add a splash more milk if nec­es­sary. 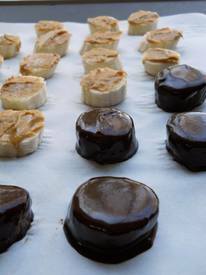 Dip the banana chunks using a fork as a lit­tle chocolate-coating fork­lift, dip­ping them into the melted choco­late. Place choco­late coated bananas on the pre­pared sheet and place in freezer until com­pletely frozen (3–5 hours). Remove frozen banana chunks from the sheet and store in a freezer container.